CJ is a pale skinned, blue eyed terran male of average height; he has to work out to avoid putting on weight. He can come across as intense, particularly to those who do not know him and do not realise that his uncertainty is usually focussed on his own failings rather than others. Born on Mars, from an early age Caspar John Hervey, known universally as “CJ”, knew that his life would be spent among the stars. As the eldest child of a noted ship architect, in Utopia Planitia Gardens he grew up in the shadow of great starships as well as their designers and users. It started a love affair with starships and Starfleet which has never ended. As a child of scientists and engineers, it was hoped that he would follow the family path and specialise in ship design, staying on Mars and working with Starfleet, but it was not to be. His character was humanities rather than science focussed; he was academic, but not forensic in this thinking. CJ’s heart was in exploration; he had seen enough of ships in drydock, and wanted to live the adventures that he had imagined as a child, taking starships out into the unknown. His parents proudly supported this goal, and at the earliest opportunity, after the most intense period of study that he had ever undertaken, the family travelled to Earth to watch him walk through the gates of Starfleet Academy. The Academy opened CJ’s eyes to the galaxy, but it also came as a shock to a lonely youth whose playmates had been models of starships left in his father’s study. He made a few friendships, and was thought of as a charismatic young officer, but was as comfortable in his own company as he was with others. Unlike many famous Starfleet captains he didn’t lead a sports team and didn’t join the Red Squad (he hated the “frat boy” attitude of the Red Squad) despite being invited, on the strength of his academics, to join. Instead, ever the dreamer, he got to know Earth, a planet he barely knew. With his one true friend, Cadet Jack Peters, he explored every continent of Earth in his spare time, picking up a love of Earth history and culture. His first posting after graduating from the Academy was to the USS Tian An Men, an old Miranda class starship; while his colleagues aimed for Galaxy, Sovereign, Vesta and Akira class ships, CJ was delighted with his posting. The Captain of Tian An Men was Captain Eddie “Bullseye” Martin, a seasoned veteran of the Cardassian conflict and the Klingon civil war and a man who had refused postings to more glamorous capital ships so that he could remain on the Tian An Men. As a family friend to the Herveys, it was clear that he had “worked some magic” to get CJ posted to his ship, and throughout their time together he was a mentor and father figure. This was nothing too special, as the whole ship blossomed under Martin’s care and attention. CJ joined as Tian An Men emerged from an upkeep, and was plunged straight into the Dominion conflict. Tian An Men, as a ‘worked up’, efficient crew, was in the heart of Starfleet’s efforts, fighting through the most of the large scale battles. 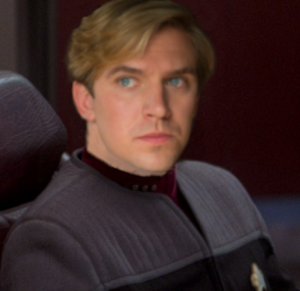 As a junior member of the Flight Control team, CJ was at the heart of the old ship’s war; when a direct hit to the Bridge killed the Chief Flight Operations Officer, CJ took over the post, famously staying at his post for forty hours during Tian An Men’s running battle with Dominion and Cardassian vessels in the aftermath of the First Battle of Chin’toka. His reward was promotion to Lieutenant (Junior Grade) and the Starfleet Award of Valour. At the end of the Dominion War CJ remained on the Tian An Men; Captain Martin volunteered his ship for support to Cardassian relief operations and so, after the “suicide run” of twenty four hours of holosuites and Quark’s Bar in DS9, Tian An Men was on station, escorting supply convoys, chasing pirates and smugglers, and supporting the fledgling Cardassian government. It was tedious, monotonous work, and the crew was delighted when the worn out old Miranda class was ordered home for some much-needed leave, crew rotation and refit. CJ’s service (and Martin’s glowing report) saw him promoted full Lieutenant and assigned to the Excelsior class USS Sarek. Sarek’s mission was precisely why CJ had joined Starfleet, deep space exploration in an uncharted region, on a traditional “five year mission”. As a specialist navigator, CJ worked with the specialist stellar cartographers to map out new regions of space, taking part in first contacts and coming up, every day, against the unknown. It was also on the Sarek that he met Christina. Lieutenant Christina Kerni was the 2IC of the cartography team. Working closely with CJ, they struck a friendship, that, over the years of the long voyage, became something stronger. Never quite understanding whether or not they were “an item”, they parted in 2383 agreeing to be close, but not really agreeing what that meant. When Sarek returned home, for a much needed overhaul, CJ was promoted Lieutenant Commander. Up until now, he had, he freely admitted, drifted through Starfleet. Now he focussed on his career, seeking a challenging assignment that would get him noticed. He applied for an opening on the USS Luna, and shipped out to the Gamma Quadrant to join his new ship. As Operations Officer (and Second Officer) of the Luna, CJ did not enjoy this assignment; he did not ‘click’ with the CO or First Officer, and it was clear that the Luna was no ready for this assignment. 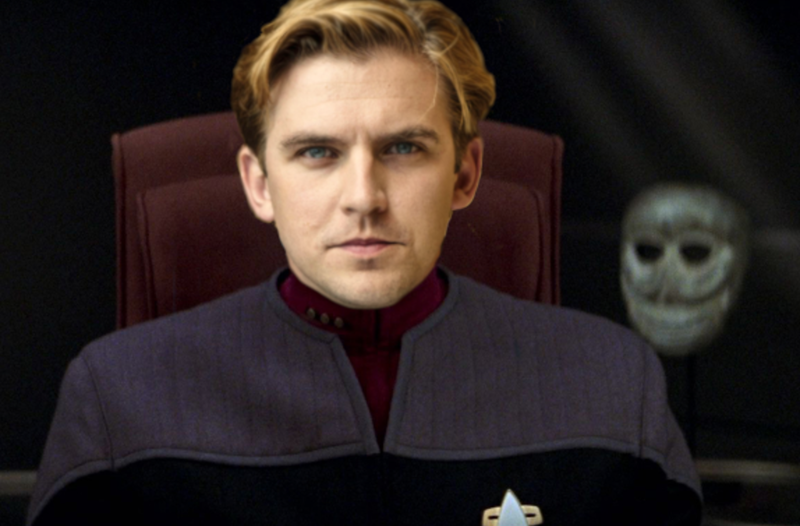 The complex political layers of the quadrant were not understood, and a number of blunders saw CJ, with the First Officer, held hostage by the Sebrisan Empire during a tense stand off. It was only CJ’s overruling the First Officer that saw them released. CJ’s insight into the fracturing of the Sebrisan Empire was read at the highest level. It was with relief that CJ was poached by Admiral Martin to step in, at short notice, to replace his Flag Lieutenant and personal aide – officially to assist with Gama Quadrant negotiations, but really because there was no one that Martin would trust. They had a wonderful year together, CJ even finding time to reconcile with his mother and explore his feelings for Christina leaving him more confused than ever). CJ’s study of the Sebrisan Empire, as well as his cool head during the Luna incident, led to his promotion to Commander and assignment to the Ambassador class USS Justinian as First Officer. An old ship, with tight knit crew, Justinian found herself operating on near the frontiers of the Alpha Quadrant for most of CJ’s time with her. After a brief spell of leave, they were loaned to the Terraforming Division for investigation of potential new Federation colonies when, close to the Tzenketh border, they were the victims of a surprise attack. CJ’s quck reactions saved the crew, although Justinian was lost.